After a morning visit to the Molecular Immunology Center in Havana, the visit to Cuba came to an end for Prince Charles, the Prince of Wales, and Camilla, the Duchess of Cornwall, on Wednesday afternoon. The heir to the British throne and his wife arrived Sunday. They met with Eusebio Leal, the Old Havana historian, before having dinner with Cuban President Miguel Diaz-Canel. They had a busy Monday learning about the baroque architecture of the cathedral and other historic buildings. During their stay, their Royal Highnesses drove a 1953 MG, sat on a park bench next to the statue of The Beatles’ John Lennon, attended a gala at the Alicia Alonso Theater, and visited a cafe at Plaza Vieja. They drank Cuban coffee, mojitos and rum. They met Cuban choreographer Carlos Acosta, who danced for the Royal Ballet and will direct the Royal Ballet of Birmingham in 2020. They also met cuentapropistas, dancers, boxers, farmers, students, musicians, engineers and even British expats. Their busy agenda did not include one meeting with any of the opponents of the Communist regime or with human rights activists. The United Kingdom wants a closer economic relationship with Cuba. 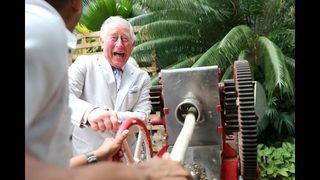 On Tuesday, Prince Charles visited a utility-size solar energy project awarded by Cuba’s Electric Union to Hive Energy Ltd., a UK corporation with a subsidiary in Cuba. The subsidiary, Mariel Solar, began the constructio of 50 Megawatts of photovoltaic solar power generation station in late November at the port of Mariel’s special economic development zone.According to Hive Energy’s CEO, Giles Redpath, once the plant reaches is fully operational by the end of this year, it will help reduce Cuba’s dependency on foreign oil. Prince Charles’ 13-day Caribbean tour will end with a visit to the Cayman Islands.